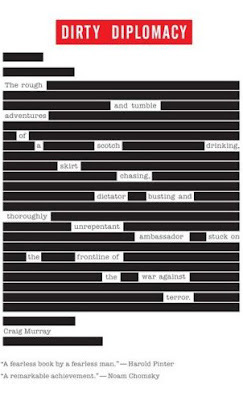 "The Rough-and-Tumble Adventures of a Scotch-Drinking, Skirt-Chasing, Dictator-Busting and Thoroughly Unrepentant Ambassador Stuck on the Frontline of the War Against Terror." yes the computer age has made censorship a lot cleaner but I would have appreciated the throw back to a mimeographed page with thick, uneven, black ink running across it! This cover is a first comp that never got refined. If they were going to make it look like a redacted document, they didn't go far enough. Conceptually, this is OK and appropriate, nothing earth-shattering. The execution, though, leaves a lot to desire. If this were a design student, I'd send her or him back to push it further. I agree with angela. Our concept of a redacted document (complete with dirty, uneven black ink and other scribbles) may overrule the reality of electronically redacted documents. The messiness would have layered onto the meaning of the title nicely. Still, a very good concept.